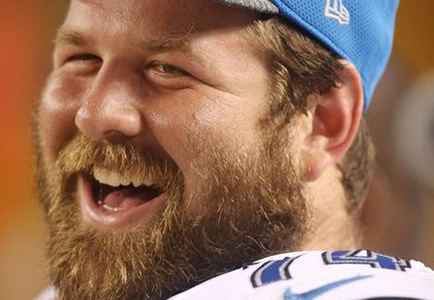 Geoffrey Schwartz, a long-time NFL veteran, is a 6-6, 340-pound offensive guard-tackle that started the 2016 season with the Detroit Lions. He previously played for the Carolina Panthers (2008-2011), Minnesota Vikings (2012), Kansas City Chiefs (2013) and the New York Giants in (2014-15). Schwartz played his college football at Oregon, where he was a three-year starting right tackle and All-Pac 10 second-team pick in 2007. Named to the All-City first team at Palisades Charter High School as both an offensive and defensive lineman, Geoffrey rated among the top 75 prep prospects (Super Prep) and was California’s fifth-best offensive line recruit. At Palisades, he started at center on the basketball team and was also an All-League baseball pitcher. Geoffrey and younger brother Mitchell are the first Jewish brothers to play in the NFL since Ralph Horween and Arnold Horween in 1923.